The band took a break after the release of their last album and Juanita, 36, had daughter Daisy Jean in 2012. Asked if having a baby had changed her view of the band she said: " That's not a cliched question. A cliched question is asking me how it feels to be a woman in a band, which believe it or not, some people still ask. They wouldn't ask someone what it's like being a man in a band, so why ask me what it's like to be a woman. "As for the baby, it was profound and an epic experience. It's good for creativity because there's new life around you. It's amazing watching someone discover everything for the first time. If seeing that unfold isn't inspiring, I don't what is. Free time is more precious but I work well under pressure. When there's nothing happening I'm terribly uninspired." 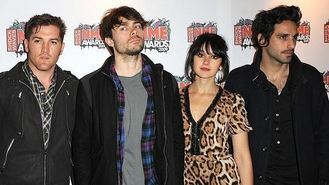 Howling Bells fourth album Heatstrings, released on June 2, was recorded in just 11 days. Juanita said: "When we finished writing we discussed that we might not do it so quickly, but then we decided that we wanted the pressure that comes with a tight time constraint. You can go for a really lengthy process, but the idea of a compressed session we could really throw ourselves into for a short burst was very exciting. "Our second and third albums were really lengthy and thoughtful and they worked for various reasons, but I did think we compromised the urgency that was captured on our first record. I thought if we did that again for the fourth album we might get back to the spirit of our debut. And I think we have done." Howling Bells go on tour from May 29 and they will appear at V Festival in August. For information, go to www.howlingbells.co.uk.